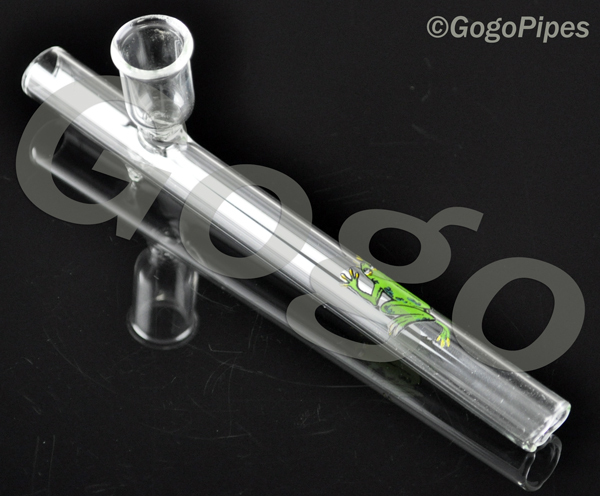 Medium Hand Blown Glass Steam Roller is approximately 6 inches long. It had different animals on it like frog, scorpion so these animal stickers may vary. Pros: I bought it for a friend. She loves it, uses it every day. Comments: will buy more when needed or find one i just cant live without it. Pros: gives very big hits for a little pipe. cleans like new by just running hot tap water threw it. Cons: none but all of my friends want mine! Comments: keep plenty in stock. once word gets out how good they hit you'll need tons more in stock! Pros: This SR112 - Medium Clear Glass Steam Roller,is what you want and need even if you don't know it. The very reasonable price, let's me buy a half dozen at a time. This steam roller will let you love...a long time! Pros: The bowl on this peice os amazing it can easily pack.5 grams of what ever you want. It rips like a champ mine came with the alien head and hand sticker pretty kool. Cons: The bowl is thick glass but the tube itself is pretty thin kinda worried about it breaking the legs aren't very usefull to small and tje bowl makes it top heavy. Pros: This pipe is a straight forward design with a nice length and good size bowl. Cons: I wish the glass was a little thicker and the feet better designed. Comments: Love being able to see and smoke from a clean clear pipe. Pros: Hits real easy,doesn't take much to fill it.Can see how much your smoke getting. Cons: No screen had to cut a custom one for it. It would have got 5 stars, if it came with a screen. Pros: Superior quality and configuration, delivers results, without any screens needed. Cons: Slightly, too sleek and slender for it's own good, yet still good for you. Learning curve, needed when setting down, after using. Tips over...more than less. Pros: Could not find exactly what I was looking for locally. They had it and the price was great. Quality was very good. Would recommend this site to friends. Pros: I bought this for a friend, looking for her first piece, i didn't want to get her something too expensive. She loves this thing so much, and so do i. It hits great and fits perfect in her glasses case. Cons: It felt thin, but for 8 bucks can you really complain? Related Item - you may like.